I am a devotee of pirate movies. 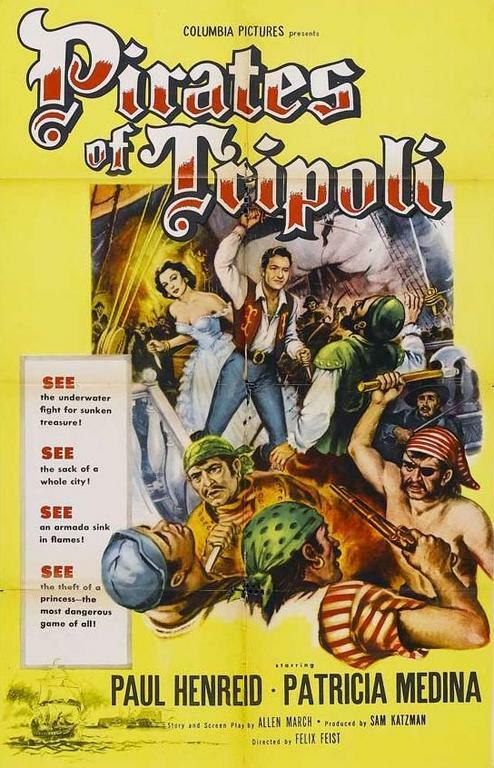 In my lifetime I have spent far too much time glued to small and large screens in search of worthwhile piratical entertainment. Alas, most of the titles I can recall proved to be disappointing in the event, although the expectation always was (and is) that the next will be one of the greats. As the fourth “Pirates of the Caribbean” film opens tomorrow, I offer some reflections on the highs and lows of the Pirate Movie oeuvre. 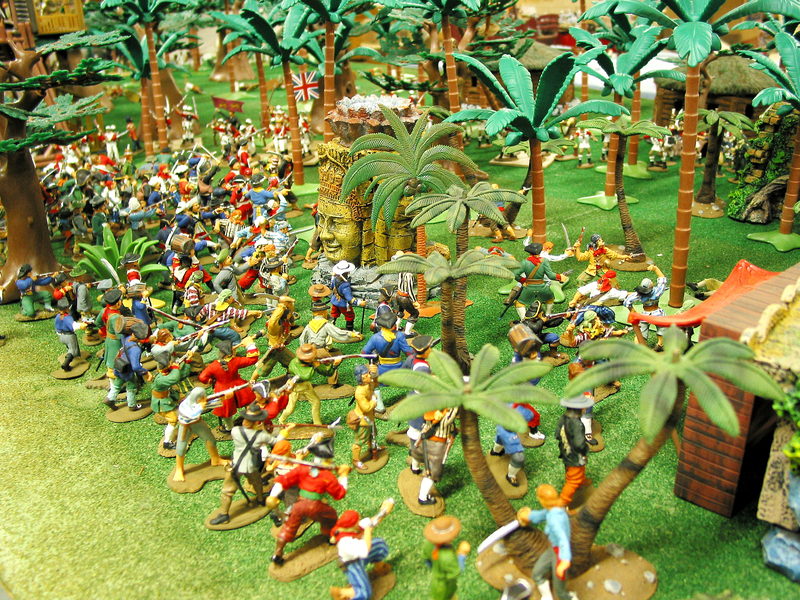 I always welcome your opinions, but on this subject, especially so, as the pirate and the toy soldier share a long intertwined history. Rangers vs snakes. Clockwise, from lower left, Auda Abu Tayi (back to camera), Rio, Sun Tzu, Colonel Chiba, James Brooke (with flag), Jacques Buffault. Harold’s Rangers generally face off against human opponents. In our adventures we tend to steer clear of monsters, supernatural creatures and magic-casting villains. But occasionally we encounter super-sized creatures. This is totally due to happenstance, such as when one of our gaming group visits a toy store where giant snakes, over sized elephants, monstrous squids and such are found in plain sight on a shelf or counter top. The temptation is too much. Although the new creature may be kept in a dark closet by its owner, it will eventually be placed upon the gaming table to threaten bodily harm against our characters. Sure, there are always complaints against the use of such death dealers, but usually (not always) the battle is fought and the survivors celebrate their victory. There are times, of course, when caution prevails. In one game we played, I, acting as dungeon master, lured a group of heroes near a cave in the American Wilderness with promises of untold riches within. Then I growled once or twice to warn them that something other than gold awaited them. They politely refused to enter and walked away. The risk was not worth the payoff to them. Thus was born a new philosophy: don’t give your friends an option. Just throw them into the action and let them take care of themselves. And so it was, on an adventure we played in 2005 against a cartel of Borneo pirates, that the encounter with a pair of giant snakes occurred. We had been fighting battles on land (more on that in a subsequent post) and at sea (ditto) when the opportunity of capturing the lead villain was offered. A group of 6 heroes crept aboard the pirate flagship: Rio (Marlon Brando from”One Eyed Jacks”), James Brooke (the White Rajah of Sarawak. pirate hunter extraordinaire), Sun Tzu (the famed Chinese philosopher, author of “The Art of War,” and the only one of our heroes capable of catching an arrow in his teeth), Jacques Buffault (French mountaineer), Auda Abu Tayi (Anthony Quinn from “Lawrence of Arabia”) and Colonel Chiba (Japanese officer, played by Juzu Itami in “55 Days at Peking.”) First the Rangers cleared the gun deck, which was lightly guarded. Then they went below in search of the pirate chieftain. Outside his cabin, however, they stumbled upon his pet snakes, each 25 feet long and sleeping across his doorway. 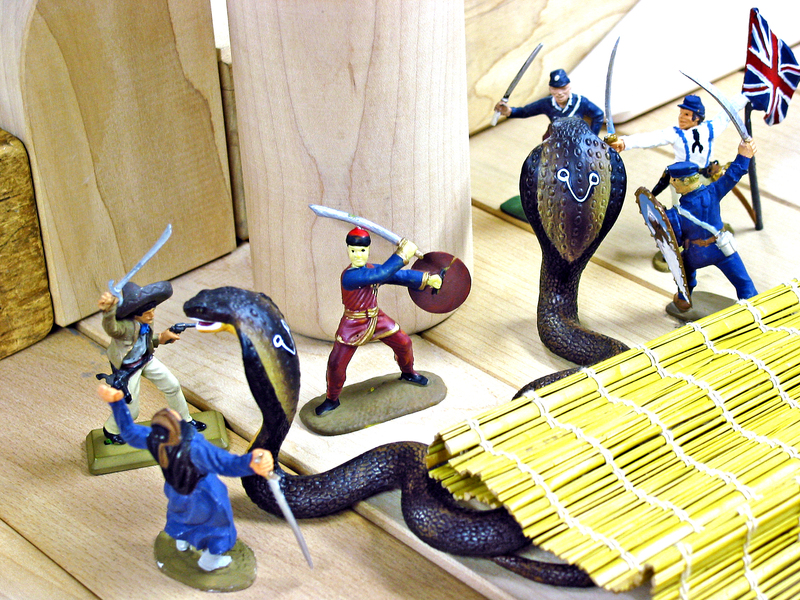 Three of the Rangers faced off against each snake. Dice were rolled. Auda went down with a bite to the arm. Swords flashed in the candle light. The snakes struck out with fang and swinging tails. But 5 swords bit deep and they were vanquished. The pirate lord attempted an escape but was captured. Snake stew served many Rangers that night.